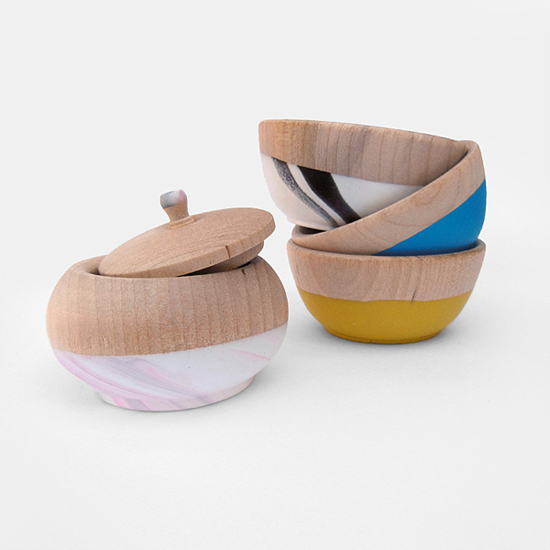 Head to www.facebook.com/acutabovetheretsy to win a set of three hand-dipped, wooden mini bowls (bright yellow, electric blue and white with black swirls) and one mini treasure pot (white with grey and pink swirls). Each mini bowl approximately 2.5 inch (6.35 cm) diameter at the top x 1.25 inch (3.18cm) high and the treasure pot is approximately 2.25 inches (5.72cm) wide x 1.5 inches (3.81cm) tall. The coloured portion is a soft rubbery material which makes them durable and non-slip, while the wood is left natural. Great for things like salt and other spices, or even to store small jewellery – they're just too cute! To enter, simply like A Cut Above the Retsy on Facebook and share the giveaway post. This competition is open to residents worldwide and the winner will be announced on Saturday 13 April on our Facebook page. You can check out WIND & WILLOW HOME'S range here.